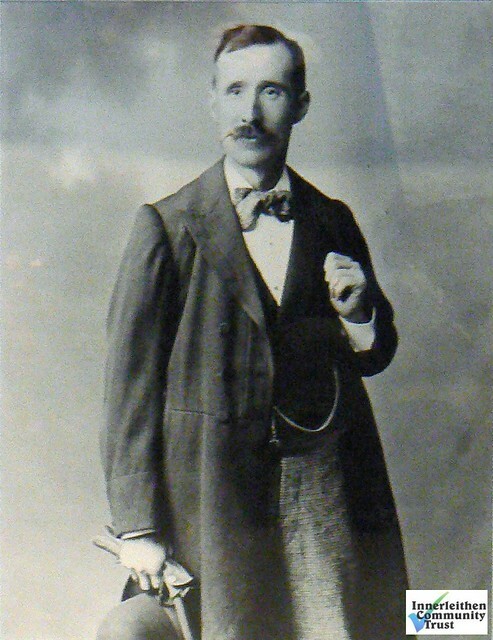 George Hope Tait was born in Innerleithen in 1861. He was deeply influenced by the area as he grew up, particularly by Traquair House, which he visited frequently when his uncle was butler there. He developed a great interest in Borders history and in its interpretation in literature and art. This love of the Borders is marked by the creation of a number of memorials, most notably to Robert Burns, Walter Scott and George Meikle Kemp. His own poems were published in a collection Poems of the Borderland shortly before his death. George Hope Tait went to Galashiels as a young man and entered the service of Milroy & Son, painters, before going into partnership with his brother to form the well-known firm of Tait Brothers. His skills as a decorator developed over the years. In 1903 he was awarded the first prize for the best decorative panel by Master Painter in Great Britain and Northern Ireland. In 1913 he entered Galashiels Town Council and served on it for over 29 years. He was closely identified with the constitution of the Braw Lads Gathering in 1930, the erection of the War Memorial and the new Burgh Chambers in Galashiels. He was a skilled watercolourist, especially of Border landscapes. An excellent graphic artist, he designed advertisements, labels and book covers. One of the best and most striking examples of his work is the Cleikum Book of manuscripts, based on the Cleikum Ceremony and the legend of St. Ronan. George Hope Tait married Catherine Riach of Duddingston in 1897 and they had five daughters. His name appeared in Who’s Who in 1921, Principal Poets of the World, 1938, and Who Was Who 1941 – 1950. He died in 1943. It was George Hope Tait who, in 1897, designed the original Burgh Arms of Innerleithen as well as the Games Banner. It was only natural, then, that he was later to head the consortium set up to inaugurate the Cleikum Ceremonies along with William Sanderson (the Tweedside Laddie) and J.A. Anderson. What a wonderful job he did. As well as scripting the legend, his skilled hand crafted the effigy of the De’il, the Cleikum Crozier and the Cleikum Chair.